Learn Spanish without leaving home! 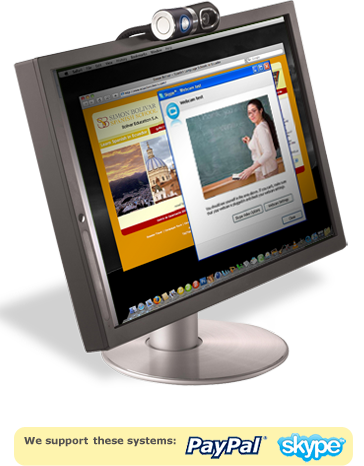 The superb quality of services that Simon Bolivar Spanish School offers offers is also available for interactive courses by means of Skype. Simon Bolivar is a leader in Ecuador, being one of the oldest, largest and most successful Spanish schools in the region. Same methods we use for our individual lessons given in Ecuador are applied by the same professional teachers and our well established curriculum. 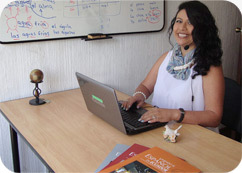 If students want to learn Spanish either for their careers, for travelling, before starting their lessons in Ecuador or after completing a course, for language practice and perfecting, or for any other reason, they can take advantage of this new alternative, having a personal, native speaker tutor in the best cost-effective way. Please explore our webpage to find out more about our programs, schedules and former student comments. What our students say about our lessons! Centro de Capacitación Simon Bolivar © 2000-2017. Mariscal Foch E9-20 y Av. 6 de Diciembre, Quito, Ecuador.